When you’re planning a wedding, you shouldn’t forget that people are just as focused on the food and presentation as they are on the bride and groom. That’s why the menu can make all the difference in whether the event is a huge success or not. 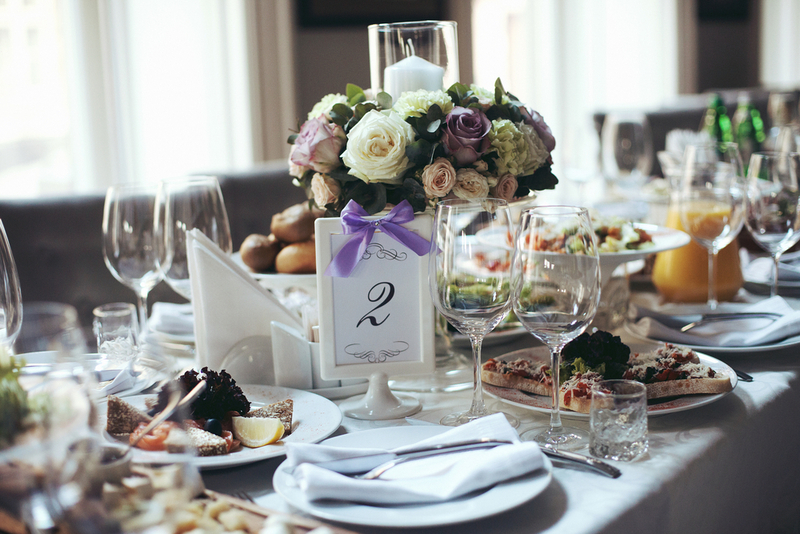 Whether you prefer formal and traditional or trendy and casual, our wedding catering packages at Centurion Conference and Event Center will offer just what you need to create the experience you’ve been envisioning for years. This all-time favourite deluxe menu is always a hit. It includes mouth-watering selections like canapes that are perfect for cocktail hour, along with your choice of our delectable antipasto platters, tortellini con brodo or Italian wedding soup, European blend salad, and your choice of pasta in pomodoro to start. For the main course, your guests have the option of choosing between our classic culinary creations like tender prime rib with beef aus jus, mixed grill and filet of chicken breast, local-braised Ontario veal chops, or our savoury filet of beef. To top it all off, our famous tiramisu or sweet triple chocolate pecan pie will leave you and your guests more than impressed. Then, once you’ve worked up an appetite on the dance floor, you can dive into our night buffet style service that features a full array of party favourites such as European deli meats, a domestic cheese tray, fresh veggies and dip, fresh fruit, and a pickle and olive tray that’s sure to keep everyone going till the party is over! When your five-star wedding event needs a winning menu, then our Gold Package is a must. This exquisite menu starts off with hot and cold canapes, prosciutto melon antipasto platter, stracciatella or Italian wedding soup, Insalata Della casa salad, and your choice of pasta with tomato, pesto, or rose sauce to start. For the mains, your guests can enjoy our delicious veal picatta, flavoursome chicken cordon bleu, or our tender prime rib of beef with au jus. For dessert, you can enjoy our excellent selection of strawberry shortcake, tuxedo truffle mousse, or our to-die-for N.Y. cheesecake with raspberry coulis or chocolate sauce and coconut. Then to keep the party going, we’ll bring out a buffet-style pizza and bruschetta spread for a late-night snack. Our Silver package is perfect when you want something that caters to your more casual and trendy style. This quality menu will start with a selection of hors-d’oeuvres, along with a choice of our tasty carrot and cheddar or cream of leek and potato soup, followed by our bundle-wrapped market fresh salad. Your guests will then select between our grain-fed breast of chicken supreme stuffed with spinach, ricotta, and porcini mushrooms, or our slow cooked roast beef strip loin with a gourmet Madeira wine sauce, or our fresh salmon wellington for their main. After dinner, dessert will feature lemon shortcake, chocolate tuxedo truffle mousse cake, or our decadent triple chocolate pecan pie. Then, just when the party is getting started, we’ll bring out buffet-style mini wrap sandwiches and nachos with dip to keep your guests dancing till the music stops. If you’re hosting an intimate size wedding, our Bronze package will give you everything you need in a smaller set menu without sacrificing on quality. The placement will start out with our customary selection of canapes, followed by our creamy soup selection or delicious tossed garden salad. For the main course, your guests will swoon over our grain-fed breast of chicken with an orange and smoked paprika reduction, or our fresh filet of salmon with ginger & lemongrass, or our juicy black Angus roasted top sirloin of beef served with a classic bordelaise sauce. The meal will be followed by our limoncello gelato or silk chocolate truffle cake to sweeten the palette before dancing the night away. Of course, when you and your guests are ready to refuel and snack, our buffet-style kettle chips and nacho chips with dips will be prepared when you are. When you’re looking to host a fantastic wedding reception, why not pick a place that has established a reputation with a five-star selection of irresistible wedding packages. At Centurion Conference & Event Center, our award-winning Wedding Manager and our dedicated team will work hard to make sure that your special day goes exactly how you dreamed it. Come check out our newly renovated and multi-functional banquet facility that is rated among the top venues and caterers for Weddings throughout Ottawa – you’ll be happy you did!